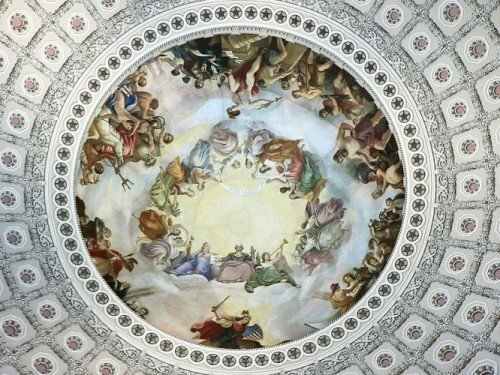 “The Apotheosis” is the work of Constantino Brumidi, an Italian artist who became famous for his paintings commissioned by the Vatican and Pope Pius IX. In 1848, an attempt to overthrow papal power in the Vatican was led by Freemason Giuseppe Mazzini, which lead to a period of chaos and the fleeing of the Pope. 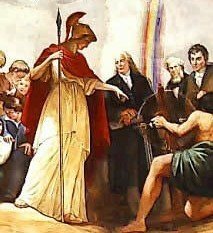 The revolution wasn’t however successful and papal power was restored by a Europeen coalition. Surprisingly, Brumidi was arrested in and found guilty of leading one of Mazzini’s revolutionary groups to overthrow the Vatican. 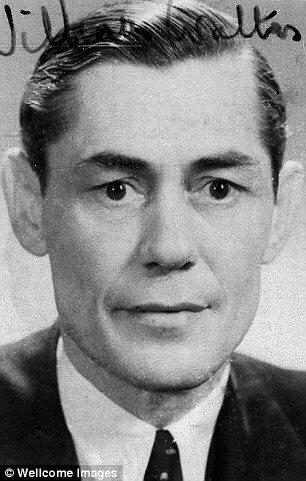 He served some of his sentence in prisons but was later permitted to leave Italy for the USA under the condition that he would never come back. He then made a name for himself in the USA by working for occult fraternities sucha s the Jesuits and such. 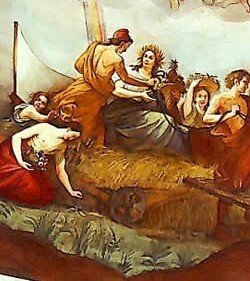 Burmidi’s story is in perfect accordance with the Capitol’s status as the “Anti-Vatican” or the mirror, Mystery Religion opposite of the Vatican. Let’s look at Brumidi’s magnum opus, the Apotheosis. “Christ in Majesty”. 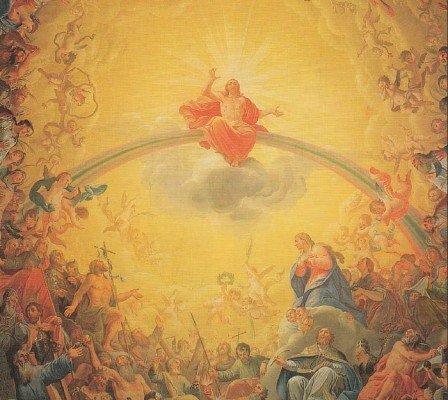 He again find here Jesus on a rainbow surrounded by religious figures. 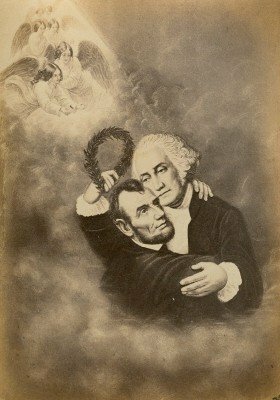 The Apotheosis sends therefore a clear message: George Washington is the American Christ. 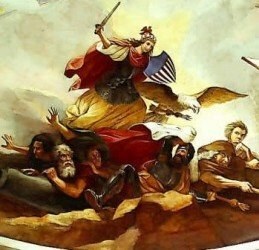 This might sound blasphemous to the average Christian but it is in perfect harmony with the Masonic/Rosicrucian/Gnostic philosophy of the builders of the Capitol. The esoteric teachings of those Orders explain that a spark of divinity lies dormant within each person. This inner-godliness can be awakened through rigorous intellectual and spiritual training and the mastering of occult arts. The result of a successful training is the birth of perfected man, a Christ, a god-man. Rosicrucians believe that Jesus Christ’s teachings, like Buddha’s, show the path to the spiritual reform that one must undertake to attain illumination. 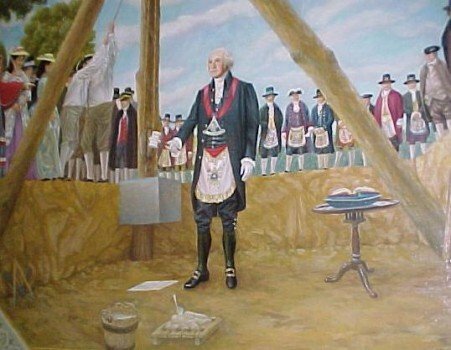 George Washington, as a 33rd degree Mason has reached this exalted level. 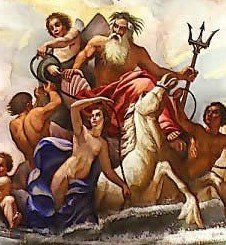 Hermes, Poseidon, Vulcan, Freedom, Ceres and Minerva are meant to respectively represent commerce, marine, mechanics, war, agriculture and wisdom. 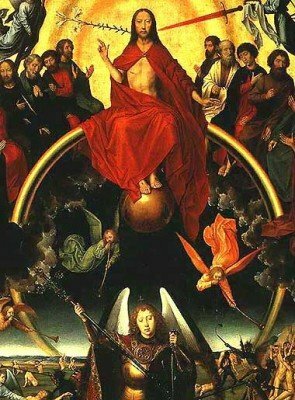 The painting hides however an esoteric, alchemical meaning. Alchemy is both a philosophy and a practice with an aim of achieving ultimate wisdom as well as immortality, involving the improvement of the alchemist as well as the making of several substances described as possessing unusual properties. 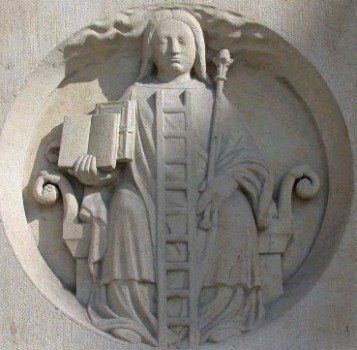 on the very esoteric Notre-Dame de Paris Cathedral. 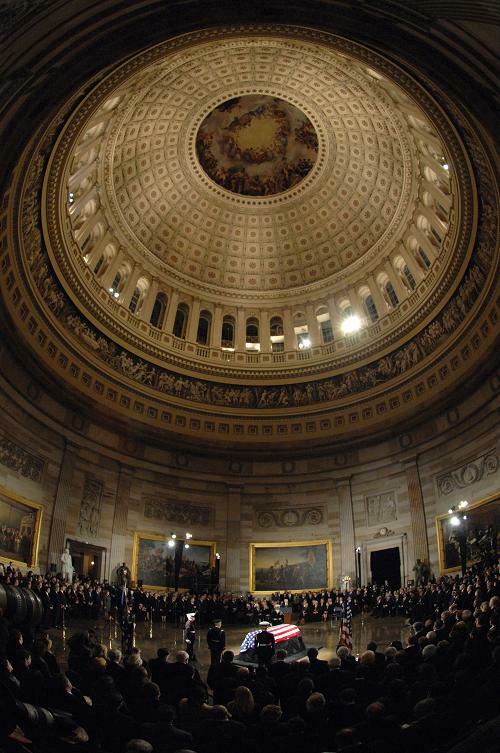 Directly under the dome, on the floor below is the Capitol’s crypt. It comprises 40 Doric columns sustaining the floor above. At the center of this circle of columns is a brass compass star which is the literal center of Washington DC. All street addresses in Washington DC are attributed in relation to this star. 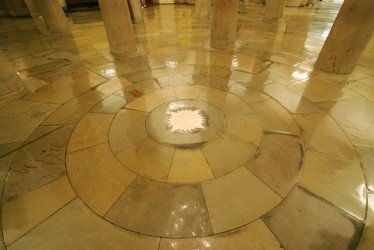 If you’ve read the other “Mystical Sites” articles concerning the Manitoba Legislative Building and the Supreme Court of Israel, you’ll notice that all of these buildings feature a crypt with columns placed in a circular fashion with a star at the center of them, directly aligned with the top of the dome. This distinctive feature present in those modern day Masonic temples hold a special significance. 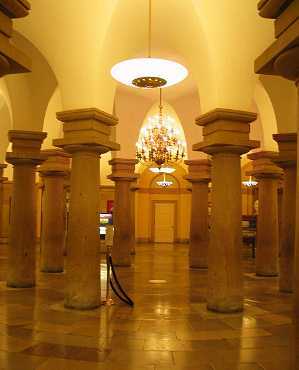 Under the crypt is Washington’s Tomb. His body is however in Mount Vernon due to a legal battle. One might argue however that the tomb was meant to be empty…a little like Jesus Christ’s was. 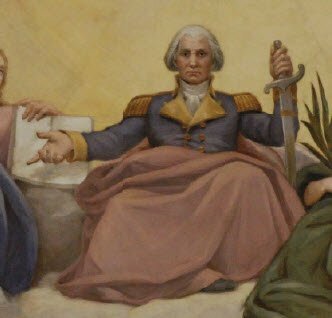 Washington is not a man but a god. 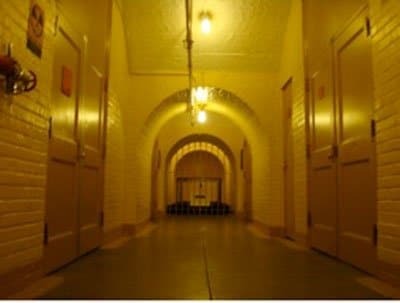 It is impossible to include all of the Capitol’s noteworthy features in a single article but here are some interesting photos. 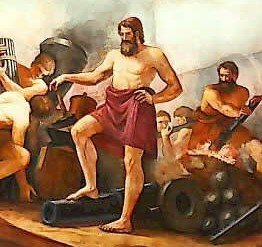 This sculpture depicting a bare chested and fiery Washington (modeled after Zeus of Olympia) was meant to be put on display at the Capitol. It caused controversy and made people uncomfortable in very Christian, very puritan early America. 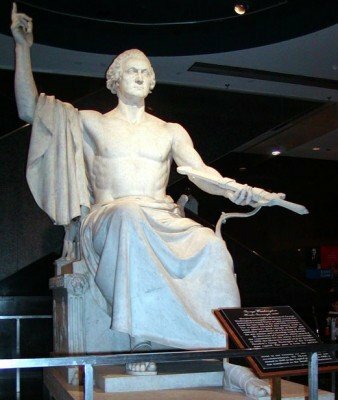 Nobody really understood why they had to look at a naked Washington. They also did not understand why he was portrayed as a pagan god. It is now in the Smithsonian. This was created by the same mastermind who brought us the above Washington-Zeus-Baphomet sculpture, Horatio Greenough. It depicts a strong White reasonable man subduing a crazy savage Indian. The strong White man, who is about 2 times his size, is saying to him “Shhh, it’s O.K. puny savage, your misery is over. 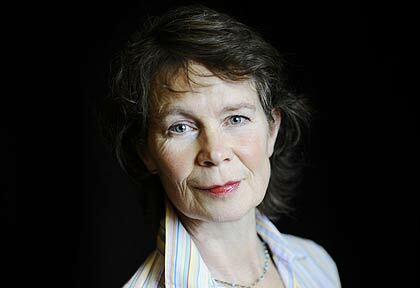 Our great civilization will take good care of you”. 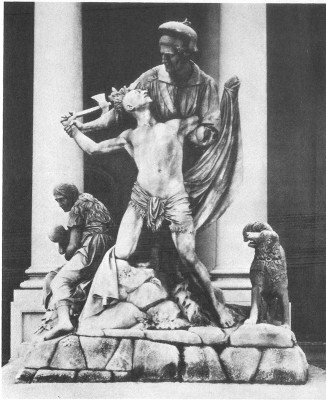 This non-offensive work is appropriately called “The Rescue” and was placed in the Capitol’s Rotunda for a while. It is now in storage and reportedly in bad condition. In 1955, a prayer room was set up next to the Capitol’s rotunda. The window depicts the god-man Washington praying and contains some other interesting symbols you might recognize.. 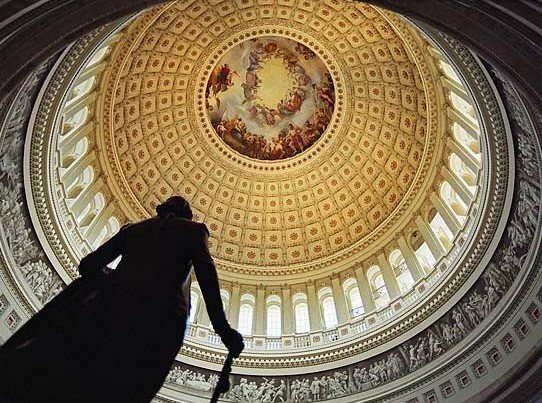 Simply put, the Capitol is America’s ceremonial center. It is where Americans celebrate their new President’s inauguration and where they morn morn those who’ve deceased. 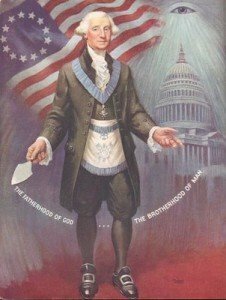 Whether we are witnessing Obama marching up the 33 steps to the Capitol after his inauguration or seeing Gerald Ford’s casket on display under “The Apotheosis”, all rituals are fully permeated with occult symbolism. 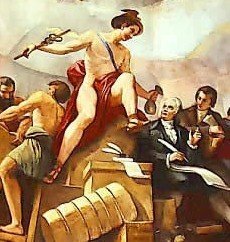 It is simply impossible to understand this country, its rulers and their philosophy without understanding their Masonic origin.